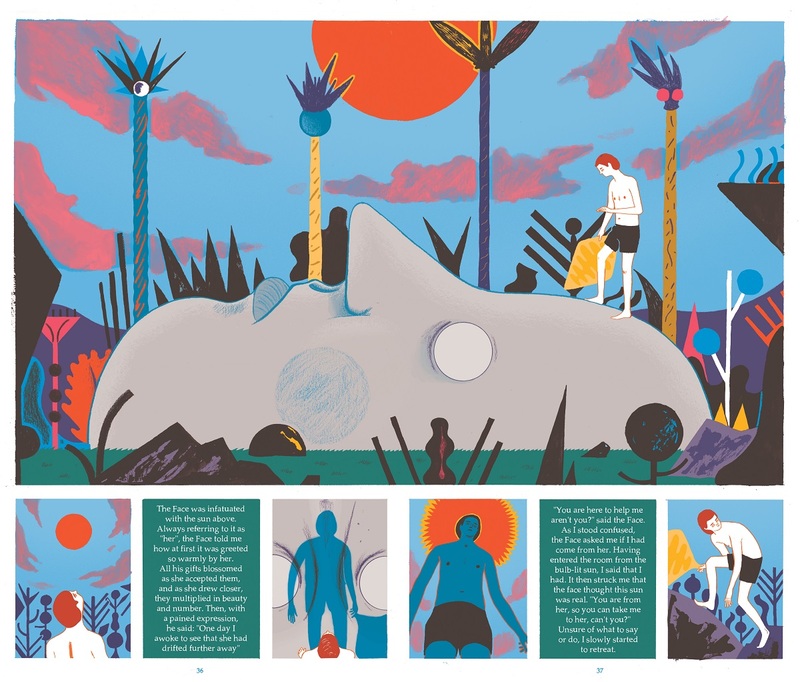 At its core, Robert Hunter’s Map of Days is a graphic novel story about how and why the ocean tides function as they do. But as with many legends, there is a lot more to this story: responsibility, understanding, and grappling with tough decisions that affect the world. Map of Days opens with a story of the nine celestial beings (shaped like floating heads) who formed our universe. These nine siblings each cocooned themselves in the matter that surrounded them, becoming the nine planets in our solar system. The Face who becomes Earth quickly falls in love with the sun, dressing himself in nature to please the “glow” above him and pull himself closer to Her. But soon the Face’s energy wanes and he falls into a deep slumber, forsaking his love and mission to be nearer to the sun. Which is where readers officially come into the story. As the main part of the story begins, readers are introduced to a boy who is staying with his grandfather for the summer. 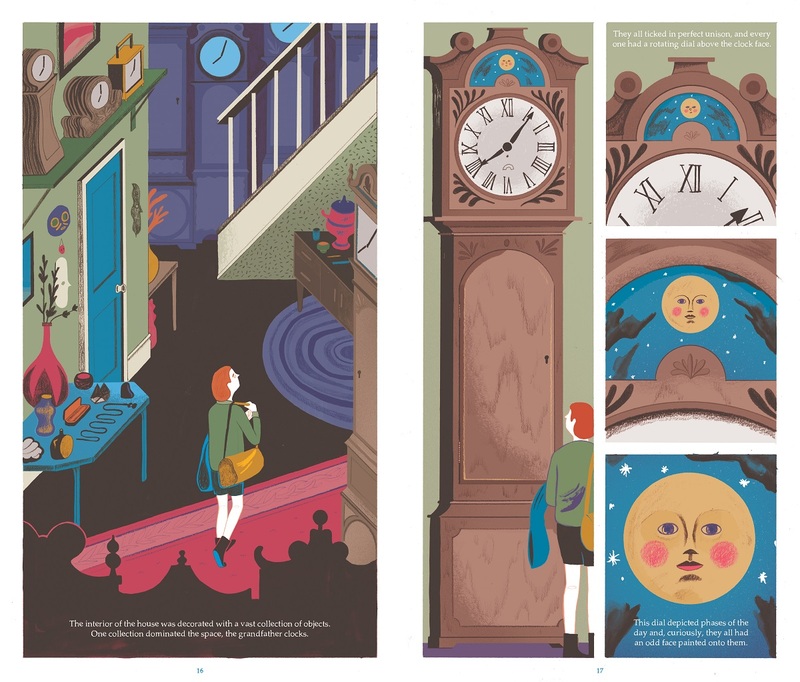 Unbeknownst to the boy, his grandfather is the guardian of the celestial Face, keeping him locked in a clock to prevent the Face from accidentally pulling the Earth too close to the sun. 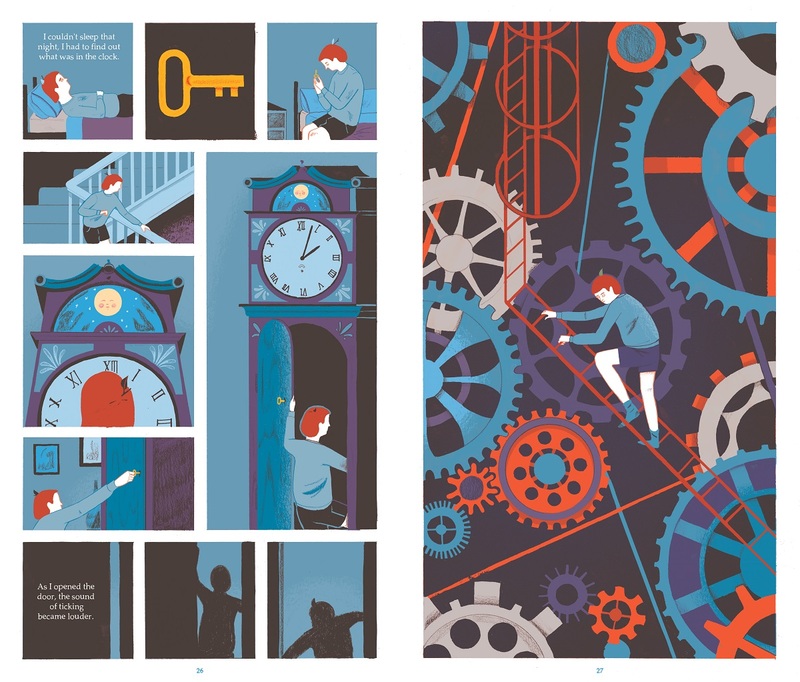 When the boy discovers the Face hidden in the depths of his grandfather’s clock, he immediately wants to help the Face achieve happiness, blissfully unaware of the dangerous ramifications of the Face’s wish. The attention to detail in this book is key, especially given that it takes place over just a few days (excluding the prologue, of course!). Every illustration pushes the story forward and gives context to the situation, and every panel serves to further unfold the mystery of the Face: we see how the twig in the boy’s hair is the precursor to the Face realizing that he’s being kept from the sun, and just as the book begins with the boy putting his feet in the ocean, so does it end with him watching the water and processing his new responsibilities. Map of Days is a careful study in folklore, metaphors, and consequences. It’s a coming of age story that allows readers only to watch, not participate. Hunter never attempts to place readers into the shoes of the boy and create a relationship with the two, but rather, beckons readers to observe and learn. There are no speech bubbles, and the text rarely inhabits the same space as the illustrations, keeping readers at a distance. 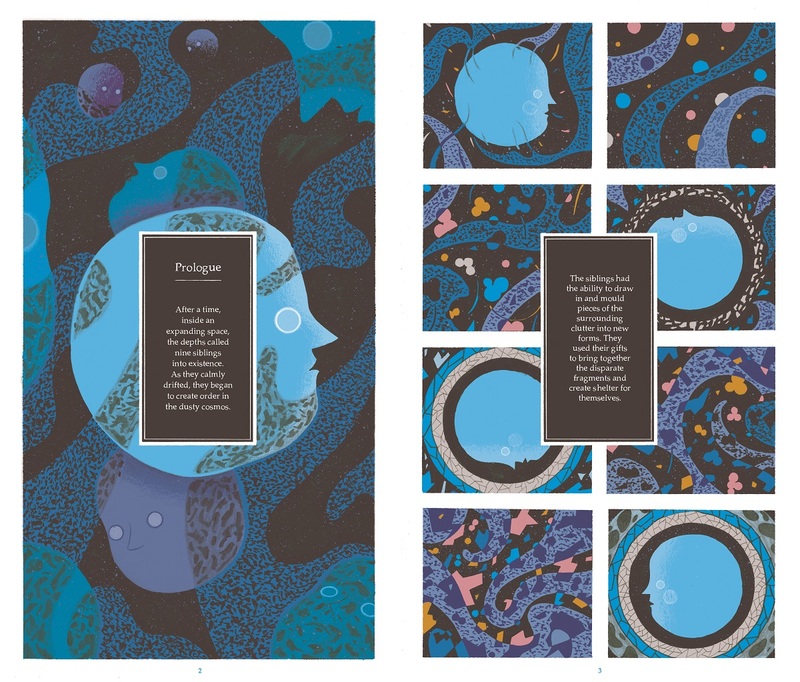 Map of Days is a story that calls for multiple readings to share all of the nuances of the legend behind Earth’s tides. It’s a story that keeps readers at arm’s length, and yet forces them to recognize the difficult decisions the boy is tasked with making. 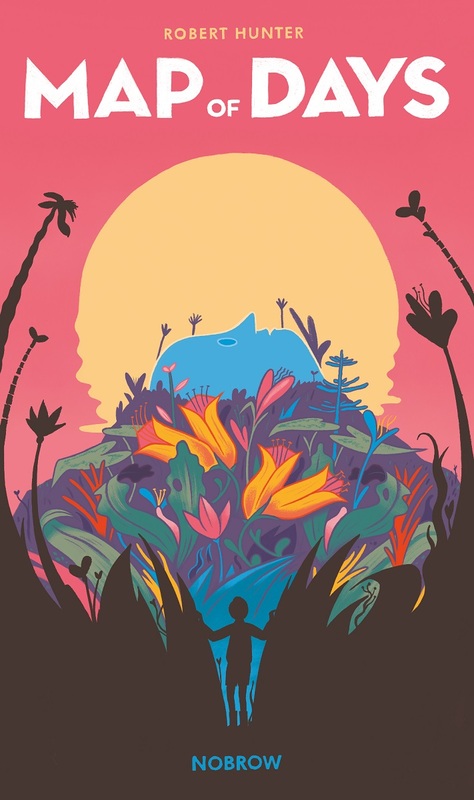 There are no easy decisions or moments for the boy in this book, and the story becomes a meditation on learning to accept that there are consequences to every action we take. Purchase Map of Days for your reader or readers.